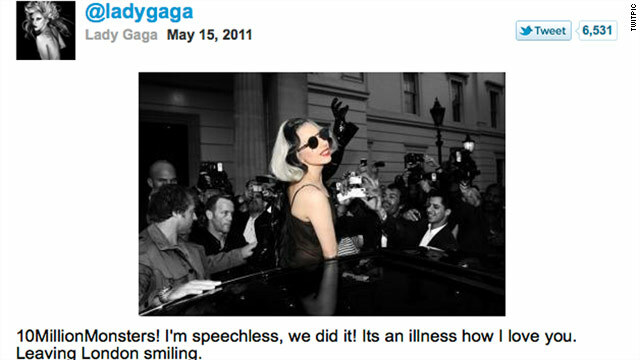 Lady Gaga also tweeted a photo of herself, saying "Leaving London smiling." Gaga tweets: "10MillionMonsters! I'm speechless, we did it! Its an illness how I love you"
(Mashable) -- Lady Gaga is the first Twitter user with over 10 million followers, which is a first for both the singer and Twitter itself. Lady Gaga celebrated this milestone with a tweet saying: "10MillionMonsters! I'm speechless, we did it! Its an illness how I love you. Leaving London smiling." The mega-popular music celebrity is a huge social media star, having been the most popular user on Twitter for quite some time now. She was also the first person to hit 10 million fans on Facebook, as well as 1 billion views on YouTube. Lady Gaga recently partnered up with social gaming company Zynga to launch GagaVille, a Gaga-themed offshoot of Zynga's hit game, FarmVille.